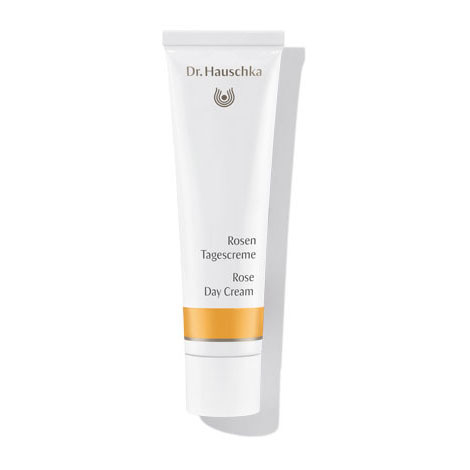 A true classic in the Dr. Hauschka range, Rose Day Cream captures the diverse powers of the rose to nurture and protect dry and sensitive skin, while soothing skin with a tendency toward redness and enlarged capillaries (couperose). Formulation: Precious extracts of rose petals, wild rose hips, marsh mallow and St. John’s wort balance and tone the skin. Shea butter, rose petal wax and avocado oil protect skin from drying. Rose Day Cream works to maintain the skin’s oil and moisture balance, offering nourishing care that reflects the balance of strength and delicateness embodied by the rose. Each morning after cleansing and toning, apply evenly to face and neck. Include the décolleté if desired. Rose Day Cream makes an ideal base for make-up. In the evening after cleansing and toning, we recommend applying a Dr. Hauschka Serum for daily, oil-free night care. For advanced care, Renewing Night Conditioner or Sensitive Care Conditione may be used for a 28-day period several times a year. Mature skin can also benefit from the Dr. Hauschka Regenerating line.